You want to make every effort to make sure your child is safe. When you are in the car make sure your child is restrained correctly, no matter how well designed the restraints are, if they are not fitted correctly they can be useless in a crash. Tests have shown that when a car crashes at just 30mph, an unsecured child will be thrown forward by a force that is thirty to sixty times their body weight. Not only could this seriously injure or even kill them, but they could also cause injury and death to other passengers in the vehicle. A ‘universal’ or ‘semi-universal’ label may give the impression that the child car seat will fit any car. However not all car seats will fit all vehicles. If the child car seat is unsuitable for the vehicle then the level of protection may be significantly reduced. The seat you choose is compatible with your car. It is suitable for your child’s height and weight. Trained staff can also advise you on whether your car is capable of taking the newest and safest form of car seat called ISOFIX, which is a fitting system that doesn’t use the car’s seatbelt. i-Size is the new European wide standard for child car seats. It does not replace the existing R44/04 legislation so you won’t need to upgrade you existing car seat. I-size has been designed to provide children with additional protection and safety in the car. Increased support for the child's head and neck and better protection in the event of both frontal and side-impact. The seat's five-point harness ensures that the child stays in the seat even in a roll-over accident. The new i-Size regulation requires using rearward-facing seats for all babies up to the age of 15 months. Recent research has confirmed that babies are safer in a rearward facing seat up to the age of at least 15 months. As it is only then that a child’s neck is strong enough to withstand the impulsive force of an average forward collision. I-size seats will fit every i-size approved vehicle. Cars will need to be i-size compliant to achieve the maximum Euro NCAP rating. For all young children, not just babies, rearward facing child car seats offer the best protection in the event of a car crash. Road safety professionals recommend that parents choose a seat that keeps their child rear facing for absolutely as long as is possible. In this position they are thrown back into support, keeping the whole body better protected but, in particular the head, neck and spine. Make sure that you get the best fit of child seat for your vehicle - the interiors of vehicles can vary considerably. Always try before you buy. If you are a two car family don’t expect every child seat to fit both vehicles. Be careful when making purchases from internet sites. Standards may vary from country to country and you can’t necessarily check the suitability for your vehicle. We advise against purchasing a second hand car seat. You won’t know how it has been used or if it hasn’t been involved in a crash. It is unlikely to come with the fitting instructions. A child’s height is the principal determining factor in selecting the correct seat, age should only be used as a rough guide. Make sure you have the correct seat for your child and car. Babies from birth to around 12 to 15 months and who are up to 13kg in weight will need to use a rear-facing infant carrier. Babies / children from 9 months to 4 years and who are between 9kg and 18kg will need to use a ‘new style’ rear facing seat or forward facing seat. Children who are 4 to 11 year’s old and who are between 15kg and 36kg in weight will need to use a booster seat so the seatbelt protects them. 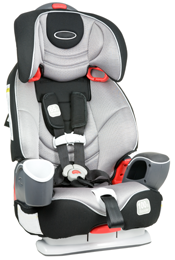 Using a full booster seat will ensure the seatbelt is in the correct position on their body. It guides the lap belt to ensure it is kept low over the hip / pelvis and ensures the diagonal belt is through the middle of the rib cage, spreading the force more evenly and reducing the likelihood of broken ribs and punctured lungs in a collision. Booster cushions, new regulations came into effect in December 2016 meaning backless booster seats will only be approved for older children. What are the new rules? Before December 2016 you were able to purchase booster cushions for children as young as 3, or 15kg. Under the new rules, booster cushions (or backless booster seats) will only be approved for use by children taller than 125cm and weighing more than 22kg. Does that mean I have to buy a new seat? The new child car seat regulations came in to effect in December 2016, but they only apply to new products. This means that if you’re looking to buy a booster cushion after the regulation change, you’ll see that they’re only approved for children over 125cm or 22kg. If you’ve got an existing booster cushion you will be able to use it without breaking any rules, but it is recommended that you buy your child a full / high-backed booster seat which can offer more protection in a side-impact crash situation. The Child Passenger Law requires a suitable child seat or booster depending on the child’s size and age. The law states that children who are 135cm or aged 12 and over can use an adult seatbelt. However a seatbelt has been designed to hold a person that is at least 150cm tall, due to this we would encourage you to use a booster seat for your child until they are 150cm tall, so they have full protection from the seatbelt. It can be easy to make a mistake when fitting a child restraint, following the advice below will help you fit it as safely as possible. Always follow the manufacturer’s instructions. Keep them safe for future reference, they show how the seat was designed to work. We recommend fitting child car seats on the rear passenger seats. Child car seats should never be fitted on a sideways or rear-facing seat. Never modify the child seat in anyway. Only use the vehicle seatbelts or a purpose built fixing kit to secure the child seat. Using any other kind of strap to fix the child seat may mean it is not properly secure. Make sure the seatbelt is not twisted and that the buckle is correctly latched in place and the red button is accessible. Children in a forward facing child car seat should only travel in the front of a car if the front passenger airbag is switched off, or if the vehicle manufacturer’s handbook states that it is safe. If no recommendation from vehicle handbook is available then we would suggest they need to be 150cm tall before sitting in the front with an active airbag. Keep children occupied on long journeys with soft toys, music and give them regular breaks. A bored child can distract the driver or fiddle with things they should not touch e.g. Car seat buckle. Teach children the dangers of playing with the buckle or wriggling out of the harness. Secure loose items within the car, crook locks, shopping, tools and hard toys. Heavy and sharp objects can cause injury when thrown around inside the vehicle in the event of a crash. Do not use a seatbelt to secure you and a child together. In the event of a collision you will crush the child. For further advice on child car seats please visit www.childcarseats.org.uk.